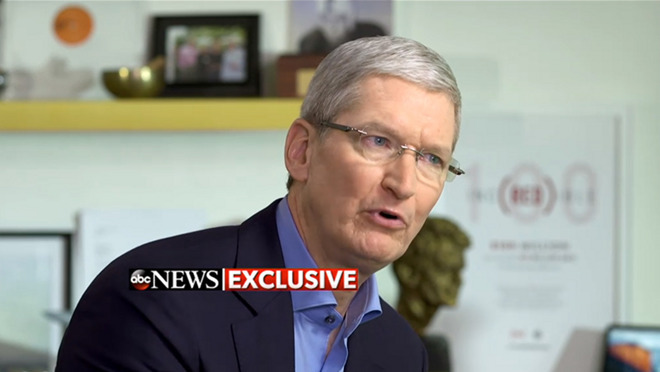 In a lengthy interview with ABC News anchor David Muir, Apple CEO Tim Cook reiterated that the repercussions of complying with FBI requests to build an iOS backdoor don't end with one smartphone, but instead have implications that ripple far beyond to hundreds of millions of iOS device owners. In questioning Cook, Muir first addressed public opinion, which relates the ongoing encryption debate directly —and solely —with 14 people who lost their lives in last year's San Bernardino terrorist attack. Cook, however, remained resolute in his stance that creating a software workaround endangers hundreds of millions of Apple customers. "It's not like we have information on this phone in the next office over. We have no other information on this phone. None," Cook said. "The only way we know to get additional information is to write a piece of software that is the software equivalent of cancer. That is what is at stake here." Put more succinctly, Cook said "the future is at stake" in Apple's legal battle for user privacy. When asked about FBI Director James Comey's public statements regarding a one-device workaround, Cook elaborated on the slippery slope argument. If Apple were compelled to build the software requested, it might later be forced to create other intrusive tools like an operating system for surveillance, or code that turns on an iPhone's camera without a user's knowledge, Cook said. These dangers, while intangible at this point, pose a very real threat to the public at large. "I don't know where this stops, but this should not be happening in this country. This is not what should be happening in America," Cook said, adding that if an encryption law is to be instated, it should first be debated in Congress. Muir asked why Apple and the FBI were unable to cooperate on the matter earlier, perhaps in a secret lab akin to those used to develop next-generation devices. In response, Cook said that while he can't comment of FBI tactics, the agency chose to take its fight into the public realm. Last week Apple was ordered by a federal magistrate judge to comply with FBI requests for assistance in unlocking an iPhone 5c used by San Bernardino terrorist Syed Rizwan Farook. Pressed further on the issue, the Apple chief boiled down the debate into one of principle. "In a perfect world where none of the implications that I'm talking about exist, yes, we would do it —we would obviously do it," Cook said. "But we don't live in a perfect world."